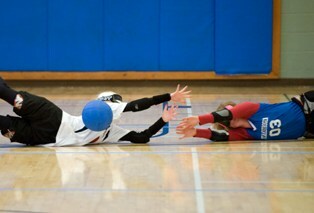 BORP Goalball 17 Championship game was the 196th game in tournament history. This was the first Championship game Jonathan Newman did not referee. Jonathan has refereed in 187 of the 196 games. All time women’s goal leaders: Lucy Greco – 50, Jessica Lorenz – 38, Kim Cruz – 23, Kamilla Ryding – 25, Christella Garcia – 12. 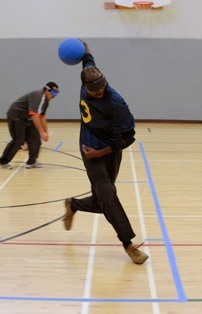 Over the years 98 different players have participated in the BORP Goalball Tournament. 59 players have at least one top 3 finish. As always the tournament is a blur and my impressions of the day are not always supported by the results. However one thing always holds true (except when it doesn’t) is that the team with the best defense wins. Another constant is the wonderful support from my family, friends, volunteers, sponsors and the participants which make this event a pleasure to organize and be a part of. Happy Holidays and see you at #18! Special thanks to Wil Toppen and Michael Boggan for their excellent refereeing and commitment to the program even during finals. Go Bears! Raw Energy, last year’s champions, started the day with an efficient 9-2 triumph over LCD. Nick Gasaway provided the firepower notching 7 goals. Roger Acuna chipped in the other 2 and Karla Gilbride established that the left wing was going to be a tough place for anybody to score on all day. Game 2 matched the veteran 2 1/2 Men squad with the novice Indecisive Bunnies. With the crowd firmly on their side the Bunnies showed that they are on their way to great goalball careers as they were tied 2-2 well into the 1st half. First goal honors for the Bunnies went to Jessica Yu with Michelle Yoo notching the other Bunny tally. Unfortunately for the Bunnies and their fans, 2 1/2 Men behind 6 goals from Matt Hines turned up the offense in the final minute of the 1st half for a 6-2 lead at halftime and a 12-2 win. LCD and Lighthouse Lightning squared of in Game 3 and it turned into a showcase for Lighthouse’sBrandon Young. Flirting with high ball line on every throw, it seemed like every throw from Brandon was either a high ball or a goal and eventually he tallied 6 goals (and 5 high balls). Marco Zepeda notched 3 goals for LCD as they went down to a 12-3 defeat. In game 4 the Indecisive Bunnies took on the Sacramento River Bats and once again put in a strong effort against a powerful opponent. The River Bats took an imposing 5-0 halftime lead as Christella Garcia flexed her offensive muscles with 4 goals. But the Bunnies showed great heart and achieved a moral victory in the second half as they held the Bats to 2 goals and scored 2 of their own, one each from Rustom Kazak and Jessica Yu. Final score 7-2 in favor of the River Bats. A much anticipated contest in Game 5 pitted Raw Energy against Lighthouse Lightning. Raw Energy’sNick Gasaway and Lighthouse’s Brandon Young took turns blasting away at each other all game in a thrilling offensive show. Lighthouse center, Shen Kuan took a hard shot to the face in the waning moments of the first half that had Lighthouse down to 2 players as Kuan went to the bench for repairs. A recovered Kuan returned for the second half of a Lighthouse 10-4 victory. Young tallied 8 goals in the win (and only 2 high balls). The final game of pool play matched 2 1/2 Men against the Sacramento River Bats. This was one of the most thrilling games in BORP Tournament history and featured scoring shots at the buzzer of each half! Thanks to a buzzer beater from Victor Hakopian, and an own goal by the River Bats, 2 1/2 Men took a 2 goal advantage and a 4-2 score into halftime. Midway through the second half the Bats tied the game at 4 but the Men jumped right back to a 6-4 lead behind consecutive throws from Hakopian and Sergio Lopez. With a little over a minute left, Joe Hamilton scored his 5th goal of the match for the River Bats and one throw later Khemnesuel Fisher tied it at 6-6. Only needing a tie to win the pool the Men came up with 2 blocks on Hamilton and had the ball with 10 seconds left. However a slow ball from the Men went out of bounds at 4 seconds and gave the Bats a chance to win and take the pool. Boom! Fisher delivered the clutch goal that the Bats needed right before the buzzer sounded and the Bats won 7-6. These results translated into these match-ups in the afternoon: 2 1/2 Men versus LCD and Raw Energyversus Indecisive Bunnies. The winners of these contests would advance to the semifinals and the losers would face each other for 5th Place. 2 1/2 Men played shut down defense and used 4 goals from Matt Hines and 2 from Sergio Lopez to register a 6-0 win over LCD and a spot in the semis. In the other semi qualifier, the Indecisive Bunnies took an early lead as Chris Lucero scored on the Bunnies first throw. However Raw Energy went on an offensive spree behind Roger Acuna (6 goals) and Nick Gasaway (5 goals) that put the Bunnies on the wrong end of an 11-2 result. The semifinal one match-up of 2 1/2 Men against Lighthouse Lightning was a game of two completely different halves that featured a remarkable comeback. In the first half, 2 1/2 Men built a 4-0 lead and thwarted every blast from the one/two Lighthouse punch of Brandon Young and Tom Foley. The second half was a whole different story. With less than 5 minutes to go in the second half, Young cannoned a goal through the Men and scored 4 more goals on his next 6 throws to give Lighthouse a 5-4 lead. This proved to be all the Lighthouse needed for the win as 2 1/2 Men could not crack the Lighthouse defense in the second half. In semifinal two Sacramento River Bats and Raw Energy each played inspired defense and a tense duel once again ended on a final seconds throw. The first half ended 1-1 as each team got a goal from their offensive leaders, the Bats’ Hamilton and Energy’s Gasaway. The defenses were still stingy in the second half but a goal each from Gasaway and Acuna for Raw Energy and 2 more from the Bats’ Hamilton had it 3-3 with 15 seconds to go. That was all that the Bats needed as Hamilton scored the winning goal to send the Bats to the title game. The 5th Place game saw Bunny-mania in full swing as the Indecisive Bunnies took on LCD. LCD was able to overcome the Bunnies and took 5th Place with stellar defense and goals from Erin Lauridsen (2), Bill Johnson (1) and Seung Lee (1). The 3rd Place game between 2 1/2 Men and Raw Energy was a tense affair with a familiar pattern. Once again the Men used tight defense and relentless offense to fashion a halftime lead. The lead of 3-0, built on 3 Victor Hakopias goals, started looking pretty shaky when Raw Energy’s Roger Acuna popped in 2 goals and closed the gap to 1 with 4 and a half minutes to go. However it was all defense from both sides for the rest of the contest and 2 1/2 Men ended up with a hard earned 3-2 victory. Two former USA Goalball teammates, current USA player, Joe Hamilton of the River Bats and Brandon Young of the Lightning, both wearing the number 3, led their teams into the BORP Tournament’s title game. The first half ended 3-3 as Young had 3 goals for the Lighthouse which were matched by 2 from the Bats’ Hamilton and 1 from Jon Simeone. In the second half the Bats put up a defensive wall and used goals from Hamilton and Khemnesuel Fisher to earn a 5-3 win and the Championship. There were 2 own goals. After he threw 10.82 in Canada last summer, Sam took a short break and then continued his training. For each competition Sam goes through a training cycle designed to get him to “peak” or throw his farthest at a particular point. He will rest, and then build up to an intense workout schedule about a week before a meet. He will then rest and try to get a massage immediately before a meet. From late August to November, he went through the paces of his cycle. He began hitting the pool Tuesdays and Thursdays at Los Medanos College for fitness exercises and stretches. The water fitness class takes advantage of the unique properties of water that enable the heart to work more efficiently. There is “hydrostatic” pressure on the body surfaces that helps the heart circulate the blood by aiding the veins in returning the blood. On Mondays and Wednesdays he got out on the field and threw, keeping his practices to exact replicas of the competition. He practiced telling his coaches how to set up his chair and then took exactly the same number of warm-ups and throws allowed in a meet. Sam made a conscious effort during this time to keep up his water intake, carrying two bottles of water in his backpack, (full in the morning and empty that afternoon). He decreased his candy intake and increased the protein and fiber in his diet. He continued to stretch and have regular massages to his shoulders and back. He also took every opportunity to get in some aerobic exercise by rolling home from BART up the hill. Hand cycling, as always, was also a valuable part of his routine. He and his brother, Brad and cousin, Ryan, completed the “Rev 25 miles” in October. Later in October he flew to San Diego for Training Camp at the Olympic Training Center in Chula Vista. There he doubled his efforts with a throwing session and weight session every day. He increased the weights and number of repetitions. A former Olympian and Olympic coach, Bill Godina, gave him tips and a workout plan for the rest of the time before the games. When he returned from Chula Vista, he lifted heavy weights and threw, (sometimes with a heavier shot) and then tapered off to 75% a week before he left for the games. On Wednesday November 9 Sam left for Houston, Texas. In Houston, he met up with the team and received his Guadalajara, 2011 gear. He also received a flyer with explicit instructions on what clothing to wear at certain times. There was a new suitcase containing a backpack, shoes, khaki pants, a polo shirt, a hat and hooded warm-up jacket to wear on the plane, a warm-up suit for medal ceremonies and various additional shirts and shorts. There was even a pair of Oakley sunglasses and a pair of slip on Nike sandals for wearing around the pool. Everything is Nike, of course, including the suitcase, backpack and shoes as Nike is also a Paralympic sponsor. In Houston, the team went through customs and processing. The next day they flew to Guadalajara, Mexico. The Telmex Stadium, near the University of Guadalajara, was the site of the Pan American games a couple of weeks before the Paralympians arrived. 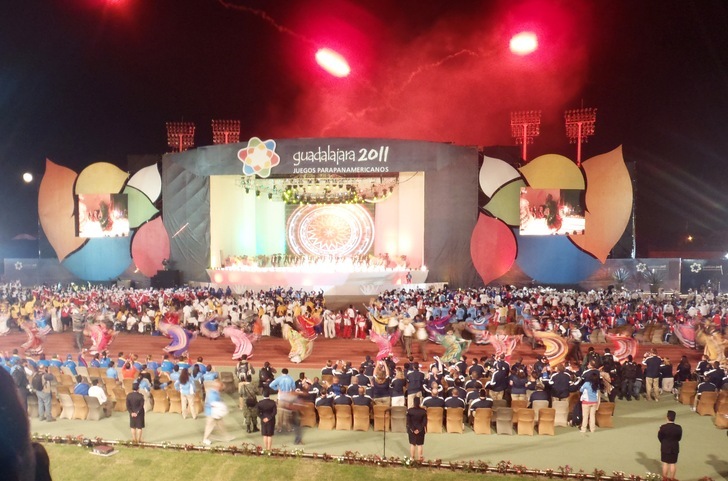 As there was for the able bodied competition, there was a beautiful opening ceremony and plenty of security for the Para Pan American competition. Helicopters flew over the stadium and the military and police presence was heavy. The team stayed in “The Village” and travelled by bus to the “Revolucion Training Center” for workouts when they were not competing. That same bus took them to the “Auditorio Telmex” for their events. There were large crowds at the Telmex. They were larger than those for the World Games in New Zealand. Sam said the upper sections did the wave at one point. It was very exciting. 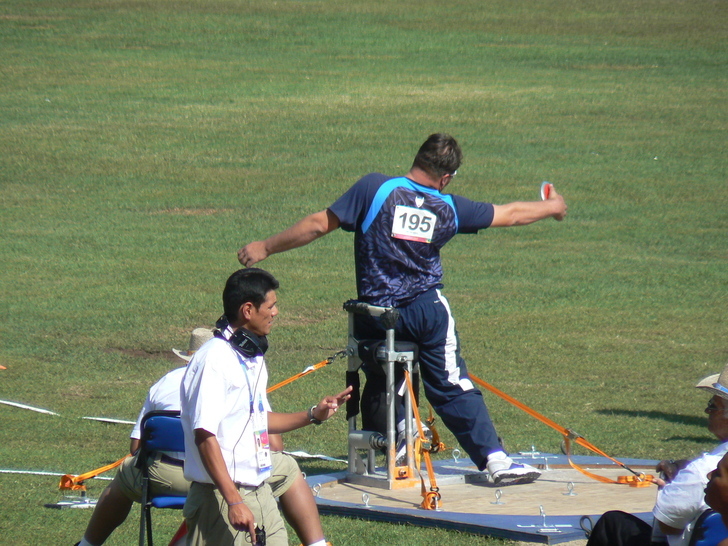 On November 16th 2011 Sam Craven threw the shot put 10.6 meters for a gold medal at the Parapan American Games in Guadalajara, Mexico. Two days later he won silver in the discus. The hard work paid off. After a couple weeks rest Sam will begin a new training cycle with local coach, Jeff Polock. He will begin training for London! 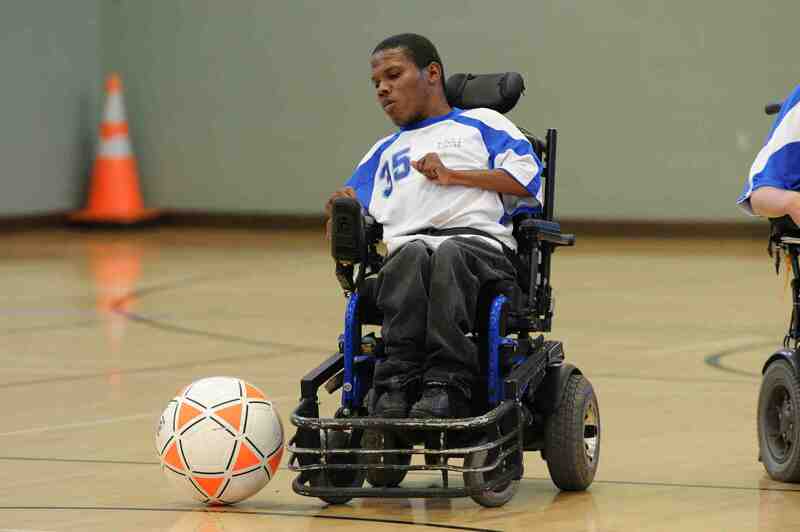 Fans of BORP Power Soccer were treated to a full weekend of great play from BORP’s 3 teams at the James Kenney Rec Center on December 3-4. The Bay Earthquakes, Crushers and Bombers showed that the hard work they have been putting in at practice is paying off as they hosted strong teams from San Jose, Hollister, Fresno and Santa Barbara. BORP’s fans thrilled to goals, assists, ball handling, passes, blocks and significant contributions from every player. Not as exciting to the fans, but a big coach pleaser was the tremendous on-court communication, an area of emphasis in practice which the BORP players put to good use on offense and defense during all their matches. Despite taking 3 tough losses the Bombers matches were characterized by irrepressible spirit as they played hard from start to finish in every game. The Crushers improved communication led to many scoring chances and a stingy defense that only surrendered 1 goal in 3 games (2 wins and a tie). Goals were in abundance for the Bay Earthquakes as they tallied 18 goals in compiling a 3-1 record. the BORP Power Soccer Booster Club who supplied delicious lunches and a variety of nourishing snacks both days. the Cal student volunteers who took time out from finals to provide great score table support both days. the BORP Power Soccer staff, families, and friends who provide the non-stop loving support for the program all the time. Please mark your calendars to attend the Seventeenth BORP Goalball Tournament. And please help us by spreading the word (flier attached). 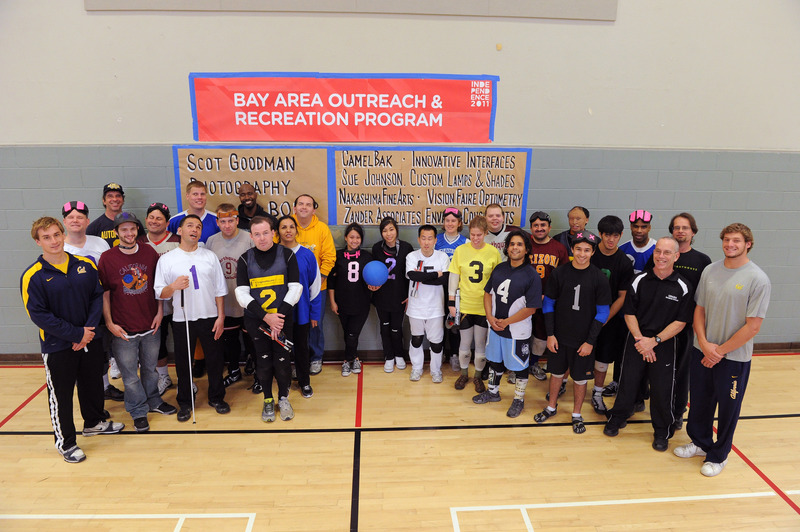 The tournament will be held on Sunday, December 11, 2011 from 10:00 am – 5:30 pm at the James Kenney Recreation Center, 1720 8th Street, Berkeley. 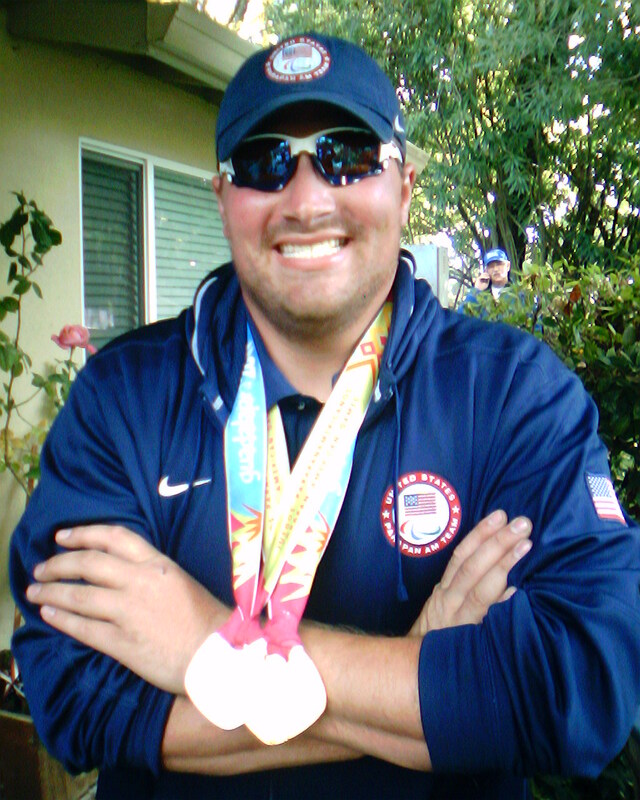 Sacramento River Bats led by long-time USA Team member and ParaPan Games Silver Medalist, Joe Hamilton. Lighthouse Lightning featuring former USA Paralympian Brandon Young.